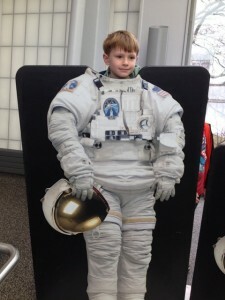 Owen preparing for lift-off at the NY Hall of Science. Catie and I took the kids to the NY Hall of Science in Queens over the weekend. It was our first time there, and we’ll definitely go back. Some really neat interactive exhibits, all pitched to be interesting for both children and adults. Plus, we preceded our visit with a dim sum lunch in Flushing’s burgeoning Chinatown, which is only a few minutes from the museum. Alas, the Hall of Science’s miniature golf course was closed for the winter season, but the kids’ disappointment was overcome by our pledge to send them into outer space. This picture of Owen seems like an appropriate image to post on April Fool’s Day.